The Pied Piper is a traditional all singing all dancing family pantomime, with an outrageous Dame, silly slapstick and a baddy to boo and hiss. With a selection of well known songs for all the family, there’s something for everyone. We look forward to sharing the Pied Piper’s adventures with you soon. Our pantos have a tremendous reputation with a Best Pantomime Rose Bowl Award win for Cinderella and nominations for Babes in the Wood, Little Red Riding Hood and last year’s Rapunzel. The Pied Piper will be the third panto written by our own Gary Kennedy and promises to provide great family entertainment at half term. Performances are nightly 7.30pm & matinees at 2.30pm on Friday and Saturday. Tickets from £8, with additional group discounts. Tickets are available now by clicking "Get Tickets" on the menubar above. There are NO FEES for online bookings and the booking site is easy to use, providing a full seating plan from which to select your seats. Payment can be made with major debit or credit cards and transactions are processed securely through Paypal. Tickets are delivered by email as E-tickets for you to print and bring to the performance. Please call us if you have a wheelchair booking as these cannot be made online. We are offering a discount of 10 for groups of 10 or more, please call our box office on 07516 270140 to book. The town of Hamelin is overrun with rats and the people of this once happy town are now at their wits end. They look to their Mayor for help and he hires the services of the enigmatic Pied Piper, a man with a mysterious past. Can the Pied Piper rid the town of the rats and at what cost? What secret does the Pied Piper keep? Will the course of true love run smoothly? Can good triumph over evil? Is this one question too far? To find the answers to these questions and many more come and see the Pied Piper. A picture of the TMTG members who represented us at the NODA awards yesterday. Unfortunately we didn't win anything this time around, but a big congratulations to director and writer Gary Kennedy and everyone else involved with The Pied Piper (performed by the group last year) on its nomination for 'Best Pantomime'. Well done to all the other groups who won awards/ were nominated last night! Feeling flat now Christmas is over? Feeling flat now that the Christmas and New Year celebrations are over? Having to get back into the same old routine with nothing to look forward to? Then we have the answer. Read more about Feeling flat now Christmas is over? The auditions took place on Monday and after a difficult task we have a strong Pantomime cast with many experienced main characters. See the cast list under Current Productions. You are certainly in for a treat as all the usuals will be there; the outrageous Dame, the baddy and this time two fairies just for good measure. If you would like to join us, rehearsals have now started so don’t delay. Please contact our Membership Secretary for more details. Contact information can be found by clicking "Contacts" on the menu bar above. Well the dust is just about settling after a very successful run of Crazy for You and now rehearsals start for our February pantomime "The Pied Piper". There will be a readthrough at Tytherington Village Hall on Wednesday 29th Oct at 7.30pm followed by auditions on Monday 3rd Nov at 7.30pm. If you would like to join us, please contact our Membership Secretary for more details. Contact information can be found by clicking "Contacts" on the menu bar above. 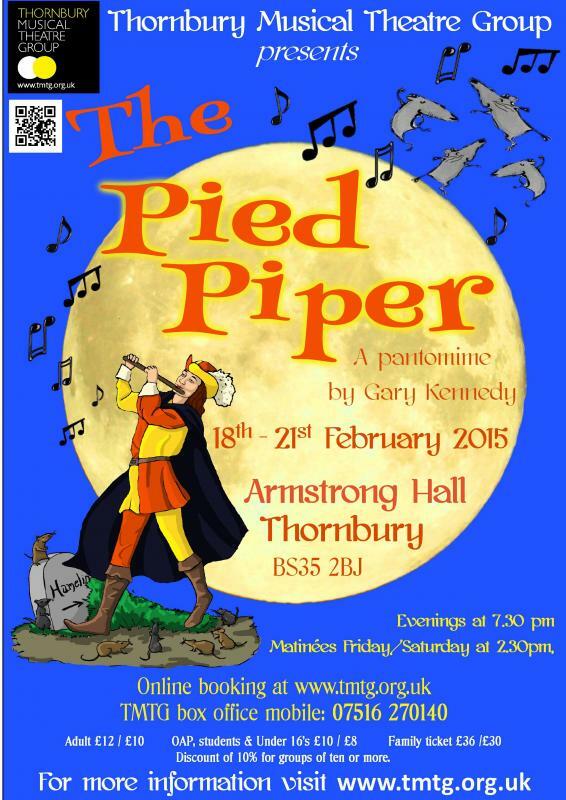 We are pleased to tell you that our February Pantomime will be The Pied Piper, written and directed by our very own Gary Kennedy who has written three Pantos, most recently Little Red Riding Hood which was nominated for a Rose Bowl award. It promises to provide great family entertainment at half term.